Elise Rittler » New Year. Half Full. Half Empty. A few months ago on a family road trip, our daughter, Riley, asked everyone in the car a question. We went around the car reflecting on the last year of our lives. Most of us answered in the 6-8 range. When the question came to Seth, our youngest, he casually said, “I’ve generally been a 10.” Then he added with a smile, “when I get hungry, I drop down to a 9 or a 9.5, but otherwise I’m a 10.” We all laughed. And we agreed with him. Seth usually feels like a 10, except when he is hungry. He’s one of those glass half full people. You probably have a pretty good idea of your typical range. Some of us are more optimistic than others. 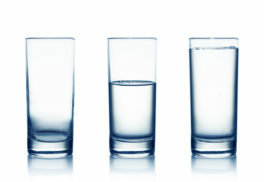 But Harvard trained researcher and author, Shawn Achor, says we aren’t stuck in categories like optimist or pessimist. We can develop a greater sense of happiness and optimism by recognizing that it doesn’t matter whether our glass is half full or half empty, but that we have the pitcher to fill up the glass. Anchor suggests five habits or practices that help us show that our behavior matters. That realization leads to a greater sense of happiness. He suggests we spend two minutes on any one of these for at least 21 days. Each day take time to note three new things that you are grateful for. This impacts what we begin to look for and notice. Think of one meaningful experience you have had over the last 24 hours and write down everything you remember about it. This helps your brain relive the experience which builds meaning in our lives. Send a thank you to a new person each day. You can text, email, call, or say it face to face. This increases your sense of social support and connection. Exercise for fifteen minutes a day. This trains your brain to believe your behavior matters. Meditate. There are many different ways to meditate, but you can even start by following your breath for two minutes. This helps you learn to focus on one thing at one time rather than splitting your attention to multiple things. As you enter 2018, may you fill your glass from a full pitcher and live more of the life you want to live.